Earth sphere's vibrant red oceans contrast with the metallic silver landmasses. Hand-fashioned from the highest museum quality acrylic. The globe rests on top of a detached sculptured base. Easy-to-read place names include country boundaries, capitals, major cities, and bodies of water. Gold latitude and longitude markings. Up-to date map is expertly hand silk-screened on the interior surface of the world globe. 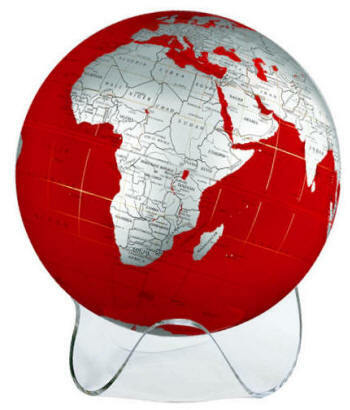 World globe is offered with a Certificate of Authenticity signed and dated by the craftsman who created it. State-of-the-art technology allows the manufacturer to offer a lifetime guarantee of quality and craftsmanship. We appreciate your interest in Artline Globes.